← What’s wrong with our bees? Last week I went to see a showing of More than Honey by the Ealing Transitions/Friends of the Earth groups at St Mary’s Church, Ealing. I hadn’t been in the church before and was surprised at how beautifully decorated it is, with rafters painted gold and intricate red and gold patterns on the arches. 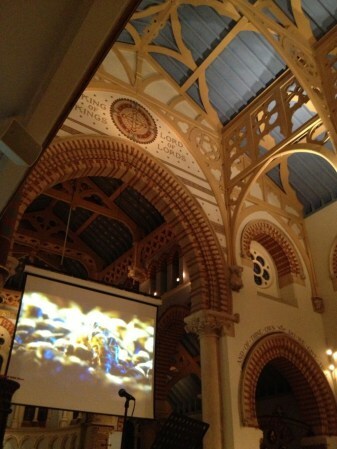 The church was packed, so hopefully plenty of money was raised for bee causes. It’s a very well shot film with some ground breaking footage of a honeybee queen mating high in the air, and also unusual viewpoints such as inside a hive being trucked about, the combs swinging back and forth. The director went around the world to film it, including California, the Swiss alps and China. Some of the practices John Miller uses do not seem healthy for the bees to me, and he admits himself that his grandfather would be shocked to see how things are now done. Mechanical equipment is used to shunt the hives about, scraping and crushing bewildered bees willy nilly. When I inspect a hive I try my best not to kill a single bee, but in these large-scale operations human interaction with the colonies is lost. The pursuit of income for commercial beekeepers comes at a cost for the bees. The trucking, the spraying of pesticides that goes on in commercial plantations, forcing the bees to exist on monocrops… no wonder colonies are dying off. In contrast I enjoyed the footage with Fred Jaggi in peaceful Switzerland. He does not own a veil and keeps black bees native to his area high up in the mountains. He claims they swarm less and are gentler, as well as better suited to the cold conditions. There is entertaining footage of both male and female beekeepers there puffing on a cigar instead of a smoker! But even amongst the idyllic scenes of wild flowers in the alps, disease lurks and sadly Fred’s bees are diagnosed with American foulbrood (AFB). The inspector fumigates the bees with sulphur to kill them and the bees and frames are then burnt in a pit. It sounds harsh but is better than leaving the colony to infect other bees. In China we meet Zhao Su Zhang, who sells pollen to farmers in northern China, in areas where heavy pesticide usage means bees can no longer survive. Years ago Mao decreed that sparrows should be killed as they stole grain from the people. This was done, but resulted in a plague of insects as their natural predators had been greatly diminished. The insects were fought with insecticides and the bees died. Messing with an ecosystem never produces positive results. Each year Zhao drives south for two days, buys flowers there and hires a room for her team to harvest the pollen from the flowers, carefully packaging it into paper envelopes. She then drives back north to sell the pollen to the farmers. Up on ladders, labourers must painstakingly dab each flower with a little pollen so that the trees will fruit. Even the slowest, most lackadaisical bee in the world would surely beat a human at this job. The film left me feeling sad and angry. We abuse the natural world in so many ways – can we really be surprised when things go wrong and bees start dying off? It’s lucky for bees that their work is so valuable to us, otherwise governments would probably do little to protect them and those of us who care would be left lamenting a missing hum. Edit: Rusty at Honey Bee Suite has written a post pointing out some errors in More than Honey: Take the Pollinator challenge. 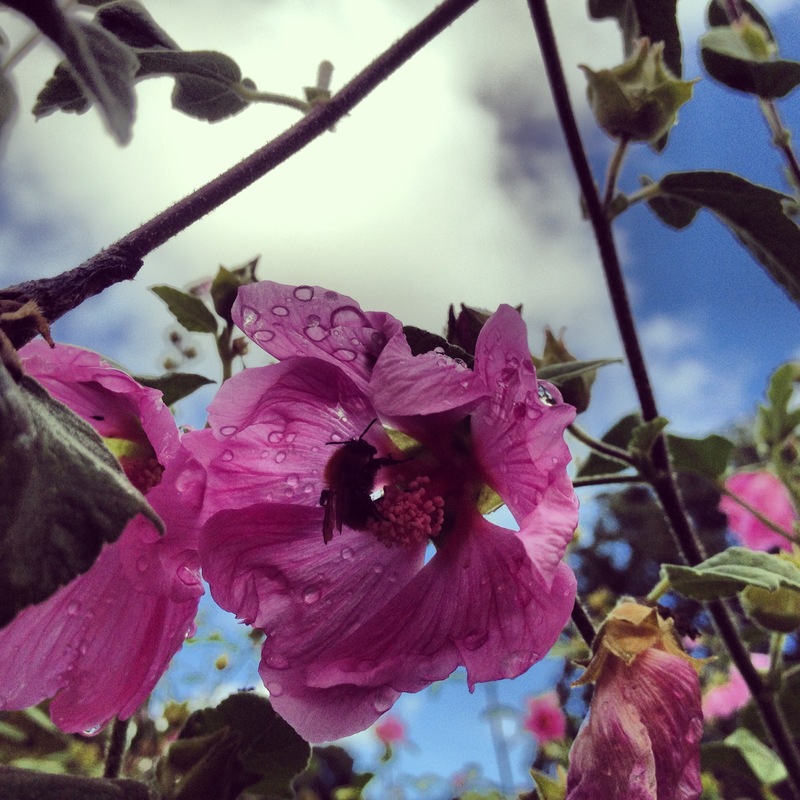 This entry was posted in Honey, Uncategorized and tagged pollination. Bookmark the permalink. Sounds like an interesting film. I’ll have to see if one can find it here. Do remember that there are commercial beekeepers here (USA) who don’t use chemicals & antibiotics. However, many commercial beekeepers have gotten into a rough position: they use chemicals & antibiotics, if they suddenly stop, my bet would be at least 50% of their stock would die (chemical dependency), and the beekeepers would go bankrupt – how would many of us feel if we were told we could no longer drive vehicles, use the internet, mobiles, and other items that cause pollution, death, and massive harm (electronics brings harm in the mining of rare earth minerals and when components are “trash”). That prohibition would cost many of us our jobs – and we don’t seem to be giving them up. As to movement of hives, sadly in the US, agriculture has now reached a point that if we don’t move bees we don’t eat. Thanks for a though provoking blog – a great read as usual. Thanks for your comment Karen. I see from your blog that you are an experienced wildlife cinematographer – what a brilliant job. You are right about commercial beekeepers being in a tough position. I think they should get more help from the growers personally. For instance, if almond producers were willing to allow wildflowers to grow between the trees, then the bees would have more varied sources of pollen and probably be healthier for it. The government could also help by making it illegal to spray at night. People are not going to make these hard choices themselves, whereas the government could step in and make the choices compulsory for the sake of wildlife. Emily, my bee mentor and I went to see that film last fall at the Vancouver International Film Festival. The hardest part of this beautifully filmed movies for me to watch was the segment where after pollination season, the hives trucked all over America are taken back to the winter yards and dissassembled….all the frames with brood go in one rack, all the honey frames in another, and then hives are re-assembled in the most appalling fashion, just any old brood frames thrown in each hive, empty frames on the outside, and the hives are all requeened. Then they are medicated to the gills and sorted for overwintering (which did not seem to be a screaming success) before the next season. It was hard as a beekeeper to watch the colonies ripped apart in this way. The commmercial beekeeper/pollinator was obviously not happy that he has to do business this way, and remarked that his grandfather would walk off the property and say he’d sold his soul. Not, I would bet, before turning his grown grandson over his knee! As the credits rolled, I decided my bees are probably the luckiest bees in the world. Doting beekeeper, plonked in the middle of a paradise of enthusiastic urban gardeners, with a lovely swathe of maples and red alders at their backs. They are feasted, dusted, oiled and coddled. I patted their hives today (it is a sunny, warm late fall day and they are madly gathering pollen) and said “bee happy, girls”. And resolved to plant much more bee forage, and cajole friends and neighbours to do the same, in 2014. Yes, that scene of the hives being recombined was hard to watch, it must be so confusing and distressing for the poor bees. And a sure way to spread disease – completely against recommended beekeeping practices! Does the commercial beekeeper have to do things that way, or could he do things a little better for the bees and make a little less money? I don’t know how much of a profit margin there is in the business. In contrast, lovely to hear how well your bees are treated! I think this is by the far one of your most challenging posts to read! I felt angry and also quite depressed at how we continue to blunder about nature. Me too. Sometimes I get overwhelmed by it all. Must remind myself that there are good projects going on too, that lots of people are on the side of nature. This is folly and madness on a grand scale. It destroys the beauty of our world and leaves it unable to produce the food that keeps us alive. Thanks for the great review Emily. I saw trailers online and contemplated going when it played in Seattle but figured I’d wait for the DVD. I have such a hard time watching these movies (The Vanishing of the Bees is another with the trucked bees) and seeing how these amazing creatures are treated like machines, and, like you say, with zero regard for how many are smashed during transport and loading. Every time I accidentally squash one of mine during a hive inspection is a loss. These commercial bees are so important, yet it’s so sad, and when I see these kinds of things it only makes me wonder it’s taken as long as it has for colony collapse. I do not treat my bees – no sugar syrup (organic sugar is too expensive and I won’t feed my girls GMO sugar) and no miticides. So far they’re doing quite well, and I feel like the less I do to them the stronger they’ll become. Thanks for all YOU do on behalf of our honeybees! I hate the feeling when I accidentally squash a bee, so like you I flinched to see all the bees being scraped and squished by machinery. I can tell you’re a good beekeeper as you care so much for them. We feed our bees sugar syrup, but as far as I know GMO sugar isn’t sold here. Thanks for writing about such a difficult subject. It always seems to come down to economics. I hope we don’t lose all the bees before we come to realize it’s going to be VERY COSTLY to hand pollinate those crops that are usually pollinated by honeybees. There are scientists working on producing bee robots, which infuriates me as it seems such a cynical solution – giving up on the real bees and resorting to mechanics. I just hope the film reaches a wider audience. It’s been on at a central London cinema too. Perhaps it’ll get shown on TV, that would be good. Thank you for this review; it gives me hope that these kinds of films are being made and shown, and that people who see them are spreading the word. As an antidote to some of the sadness that this film clearly generates in those who care about bees, I suggest watching “The Bee Movie,” a quirky animated film that came out several years ago. The movie actually makes some of the same difficult points, al-bee-it much less scientifically, but the terrible bee puns and other silly bee-havior help the medicine go down a little easier. For best results, watch with a child (or several). If no children are available, a bit of local mead would probably enable the necessary suspension of adult seriousness. Thanks for the tip! Some of the local beekeepers I know produce the kind of homemade mead which makes it impossible to remain serious, or indeed upright. What a terrible way to treat bees, no wonder they are so distressed and die. Yes, CCD doesn’t seem that surprising to me. Yes, brilliant isn’t it? They originally tried with bees from New Zealand, but discovered the short-haired bumblebee population there was very in-bred, as they were descended from just a few queens imported from England in Victorian times. I’ve only seen clips of More Than Honey and both looking forward to/dreading seeing the whole film. There will be tears. Mostly at how roughly bees are treated by commercial beekeepers, no wonder some colonies abandon the hive (CCD!). Great review Emily! It was very difficult to watch at times, but there are also more positive stories and some great characters. Thanks for this Emily, I felt the same when I saw the film, “Queen of the Sun” and also when I read the book “World without Bees”. I think the way bees are treated by the US commercial bee farmers is basically abuse of nature and it’s no surprise to me that CCD is the result. You are absolutely right about planting flowers in the almond groves. As for the hand pollination, I seem to recall that in Bill Turnbull’s recent TV programme they tried hand pollination and showed it was both very costly and crop quality was impaired. I have signed the bee petition, hopefully lots of other people will too. Humans just can’t beat bees at pollination, we need to look after them. When it comes to CCD, I’ve long thought that what _we_ do is far more problematic than any other potential cause. I will have to look for this film… Is there an online source for it? I missed it here when our local documentary group had a screening. I inquired about purchasing the DVD for our beekeeping group and it was $349, but it came with Public Performance Rights (PPR). We are still debating whether to take a collection from our group to have it available for personal screenings. Perhaps you could do a big showing and invite members of the public to make donations too. The state of the bees all over the world is troubling but their problems seem to be able to reach some people until know unaware of the imbalances in nature caused by human intervention. They are suffering but at least they have touched a chord in many people and increased an awareness which I hope will amplify. Yes, there is some hope. It is good to see so many groups of people taking an interest in helping them. The film has some more cheerful moments too, and some great characters. Also some spectacular filming sequences – worth it to see the queen mating on the big screen alone. I was distressed reading this post thinking of the fact it is all about the money. Animal abuse in no uncertain terms. I read through the comments too which only made me feel worse. For such a social creature this bee treatment really is a travesty. One day bees will be no more and who will we blame? Yes. Although I do believe commercial pollinator bees have a better deal than many farm animals, at least they are able to fly out of their hives whereas pigs, cows and chickens all over the world are squashed into cages so tiny they can’t turn around in them and never get to see daylight. I always buy free-range meat (which has a legal meaning in the UK) and try to avoid eating meat on meals out for that reason.